With the recent release of a new demo of Blockade Runner, I was able to sit down with some of the developers to discuss their studio and latest project on behalf of Tactical Gamer. Strait Raider: Can you tell us a bit about how ZanMgt began? Aaron: It started with us building our own games from scratch when we were kids, and as each of our younger siblings gained interest we'd teach them what we knew and work together on our homebrew projects. SR: So what roles do each of you play in the team? A: The roles are based on everyone's individual skills, and luckily for us we're pretty much split down the middle with coders and artists. Gabriel: Aaron, Micah, and Terah being the artists, Zack, Nathan, and I [Gabe] being the coders. SR: You have a very close connection with your player community. How do you feel this effects the development of your game? How do you see this relationship evolving as your player-base grows? A: Everyone in the community gives us great feedback on how we're doing and really help to keep us on track. The community that's grown is really above and beyond what we could have hoped for, and we're especially thankful for their patience, as we've spent the past year building Blockade Runner's engine. G: As to the community's evolution, we hope there won't be much of a change! We always want to remain connected to the community. It sounds corny, but the truth is we wouldn't be here without them. SR: Alright, time for some heavy hitters. What is Blockade Runner going to do that sets it apart from anything else on the market? A: There was a time with Minecraft when Notch would add entirely new mechanics to the game every Friday, and thanks to the freedom of the voxel engine, the game could go nearly anywhere each week. That kind of iterative and evolving game had a big impact on us, and we'd like to continue that experience in Blockade Runner, expanding the game's universe one step at a time. SR: That's a good segue into my next question: What stage is BR at in development? Where do you hope to be in 6 months? A year? A: We just wrapped up the editor to a point where it's stable, so we now have a good opportunity to break the solo/multiplayer with rapid updates while still leaving everyone with something for their hard earned cash in the editor. With gameplay now the focus, Blockade Runner should start heading towards a proper game within the coming months. We'll be starting the gameplay from the character alone on an asteroid and work our way up with no instant menus for travel, trading, etc. It's important to us that we maintain persistence with your character. G: By next Fall we plan on a stable version of the multiplayer that will include the ability to mine, trade, construct and fight, and will steadily grow the game's features; EVE:Online being a familiar example. SR: What have been your biggest challenges thus far in creating Blockade Runner? A: Building the custom voxel engine from scratch to work with future capabilities was a huge setback for the gameplay side of things. Instead of adding in fun things like missiles, NPC's, planets, etc, we've been raking the system so it can handle things like hi-def textures and lighting, exterior plating, angles, large custom geometry (furniture, warp cores etc), power lines, glass, ships breaking apart, weapon destruction, thrust, mass, vacuum, heat and liquid simulation. That said, we're firm believers in short term loss, long term gain. SR: What made you decide to implement multiplayer so early in development? A: Implementing multiplayer at an early stage is essential for the game since there's a lot you can do to bottleneck yourself if you're not anticipating netlag and transfer issues. In addition, we're following Notch's good advice with "building the game for multiplayer first". SR: What structure are you planning for multiplayer? We've heard comparisons made to Minecraft's survival multiplayer. Do you plan to implement other modes? A: We'll retain many familiar building and sandbox mechanics as Minecraft, however over time the gameplay will probably resemble something closer to Borderlands, where you and your friends complete quests together co-operatively, collecting loot, raiding ships etc. As for other gameplay modes, we might add a pure deathmatch option in the future, but at present it will be handled in a Diablo II/Borderlands fashion where you simply un-ally with whoever you'd like to spar with. SR: Could you tell us about the planned procedurally generated galaxy? Would this function in a similar manner to a Minecraft world, with exploration furthering the boundaries of the galaxy? A: In general, it'll probably be closer to EVE when exploring the galaxy, with planets, asteroids and the like being procedurally generated, but yes you will need to explore to reveal more of the game's galaxy map. SR: So what would these galaxies be populated with as far as spacey objects and NPCs? A: We're looking at our old favorites like Sid Meier's Pirates and EV:Nova for inspiration on star system behavior and economies. Through our Solenium “dimensional matter” we'll likely include Metroid-esque creatures to discover on asteroids, and early vessels you might encounter will probably contain Dalek-like machines, or be entire living machines ala the “Shadow” vessels of Babylon 5. That is, until we have AI crew functioning well enough to risk populated ships without losing immersion (people going through walls, etc)! Nathaniel: Yes, and as many other kinds of aliens as possible! SR: Could you explain for us what exactly is meant by "Living Starships"? A: In traditional games, a single hit point variable usually defines whether a ship lives or dies. The counter hits zero, and bam its dead. With Blockade Runner we are able to have every bulkhead, every conduit, every part of your ship actually matter and make a difference. G: Power lines have to be placed down, and everything relies on power. When you cut that power line the part of the ship that was receiving energy from it will "die". Every piece of equipment that is not on batteries or capacitors will shut off. A: Something as simple as a badly placed power-node could explode and cut off access to an important deck or system, or perhaps block personnel from receiving medical attention, etc. A ship might end up “bleeding to death” if the wrong spot is hit. A: We'd really love to translate this to biological vessels as well (space Jabu jabu anyone? [Zelda: OOT]) in the future, but that is probably a ways down the road. SR: That sounds interesting, but how complex will the ship systems be? Am I going to need to finish my engineering degree before I can build a good ship? A: We've got an in-universe "hand wavium" system that will help new builders start with a ship that runs and moves as they'd expect it to. The idea is to make the handicap gradually become a nuisance so the player is weaned into learning more of the engineering behind the ships. 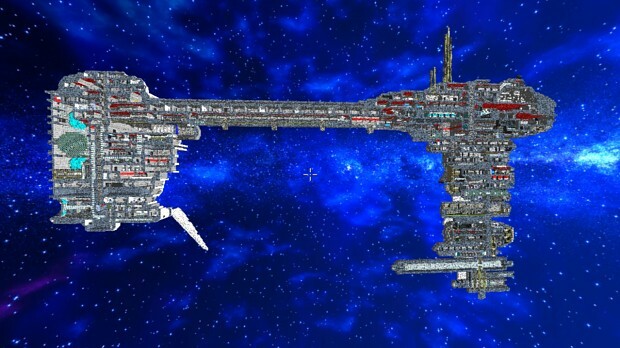 N: For a proper ship though, yes, there will likely be many intricacies to favor good design. A: We'll definitely provide pre-made ships that you can buy/find/steal in the game as early as possible so you can play the game without having to build the ships yourself and leave that to the engineers in the community. So you can always just add “special modifications” ala Han Solo. SR: You've already included community-created content in Blockade Runner. How do you think a modding community will effect BR if one develops? A: We believe mods are very important for experimenting with ideas, and potentially game-breaking ones at that. With Blockade Runner we're going to slowly open as many areas for the community to access and modify the game as we can and see what they come up with. The results with modding are something you can't predict, and that's part of the fun! SR: Tactics and teamplay are a strong part of the community here at TG. Do you think BR will encourage players to work together towards common goals? A: The game will be intentionally built with co-operative gameplay in mind, from escaping your first asteroid by scraping together a skiff, to mining rare metals to purchase equipment, etc. However, crewing a ship together is something we're very much looking forward to, with some players on the bridge, some running the engineering room, operating the turrets, or flying star-fighters out of the hanger to protect your mothership. A: One mechanic that can very much encourage team-work will be exploring "unmapped" routes between star systems, where your party and your ship will be expected to survive a period of time without any kind of support or backup. It'll just be your crew, your ship, and your wits. SR: Well I just want to thank you guys all for taking the time out of your busy schedules. Best of luck in the future! A: Thank you, we all appreciate Tactical Gamer's interest in Blockade Runner and hope to play with you guys online with BR soon! Full version access is available for a contribution of 10 USD or more. Tactical Gamer has a contest to win free gift codes for the full version of Blockade Runner here.